Rendering for 425 Westchester Ave., New York, N.Y. The new building will have a total floor area of approximately 144,000 square feet. Michael Graves Architecture & Design will serve as the project architect. 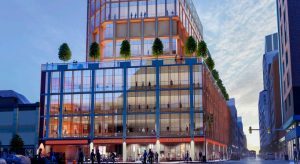 The new building will feature state-of-the-art amenities including a charter school, rooftop play space, street-level retail space, nonprofit office space on upper floors and a below-grade cellar. “The collaboration between Hollister and Michael Graves Architecture & Design has been exceptional in solving for AB Capstone’s needs and providing the best possible design for them, their tenants, neighborhood and environment. The collaboration is progressing seamlessly!” stated Andrew McLaughlin, project executive at Hollister Construction. The project is scheduled to break ground in the first quarter of 2019.